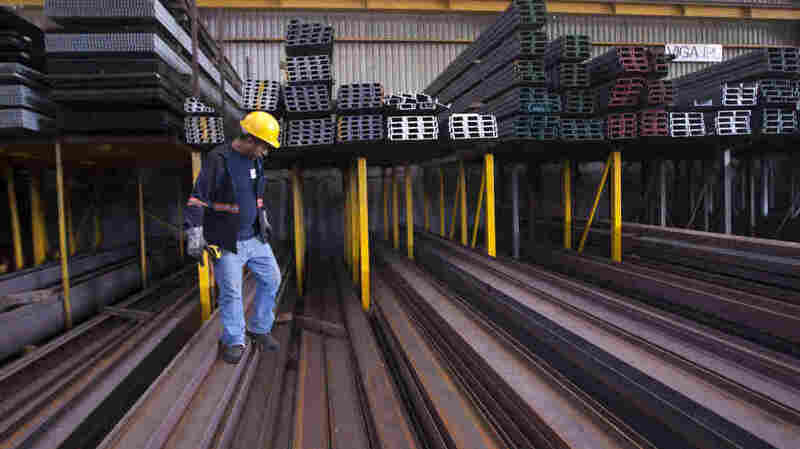 Mexico Hits U.S. Steel And Farm Products With Tariffs, Retaliating For Trump Move : The Two-Way Mexico is putting tariffs on imports of U.S. steel and farm products — including pork and cheese — as it hits back at the U.S. for the Trump administration's tariffs on steel and aluminum products. A man works in a steel distribution factory in Monterrey in northern Mexico last week, when the U.S. tariffs on steel and aluminum took effect. Mexico is putting tariffs on imports of U.S. steel and farm products — including pork, cheese, apples and potatoes — as it hits back at the U.S. for the Trump administration's tariffs on steel and aluminum products from Mexico, Canada and the European Union. Signed by Mexican President Enrique Peña Nieto, the decree also suspends the country's preferential tariff treatment of the U.S. It was published in Mexico's official gazette on Tuesday. The move comes one day after Mexico's Economy Ministry said it will start proceedings against the U.S. in the World Trade Organization, where it's seeking a dispute settlement over the U.S. tariffs on Mexican products — 25 percent on steel and 10 percent on aluminum — formally took effect last Friday. Canadian Prime Minister Justin Trudeau called the U.S. tariffs on Canadian aluminum and steel "unacceptable." As NPR's Brian Naylor reported, Trudeau also tweeted that Canada will take retaliatory measures effective July 1 on products ranging from steel to whiskey. And shortly after the U.S. tariffs took effect last week, Europe's top trade commissioner said the EU also will now consider "rebalancing measures." "We are not seeking to escalate any situation, but not responding would be the same as accepting these tariffs, which we consider are illegal," Trade Commissioner Cecilia Malmström said.